Soft adventure travellers are a demanding lot. On the one hand they want to explore new territory, get off the beaten track and enjoy nature in all her kick-arse glory, rain, hail or shine. They’re also pretty intent on creating lasting memories that will ultimately give them enviable bragging rights when they get back home. But increasingly, they’re also wanting comfort at the end of activity-filled days. You know, like a real bed (none of those yoga mat-thin blow up air beds or toilets that require that users first dig a hole), superb meals worthy of a city restaurant (and wine too, thanks very much), along with somewhere comfortable to relax with fellow travellers. Bare bones camping rarely cuts it with these sort of travellers. So it’s a little bit thrilling to find myself heading off on a hiking adventure (more like gliking – as in glamorous hiking) over the next couple of days to the spectacular Scenic Rim region of northern New South Wales. Though the hiking will surely be superb I’m just a little bit thrilled to read in my itinerary that there’s a 7 course degustation dinner (with matching wines, thank you very much) mid-hike. That’s my kind of camping sustenance! Oh, and there may or may not be spa treatments involved. Spicers Retreats, who operate the bespoke Brisbane Spicers Balfour Hotel in a gorgeous old Queenslander minutes from the CBD, have put together a Scenic Rim Trail that passes through stunning landscapes of northern New South Wales. Bedding down at Spicers Canopy (luxury glamping style) and Spicers Peak Lodge (luxury lodge style) retreats are two reasons to lace up those hiking boots. Glorious exquisite food is another. Stay tuned as I report back from this journey this week. 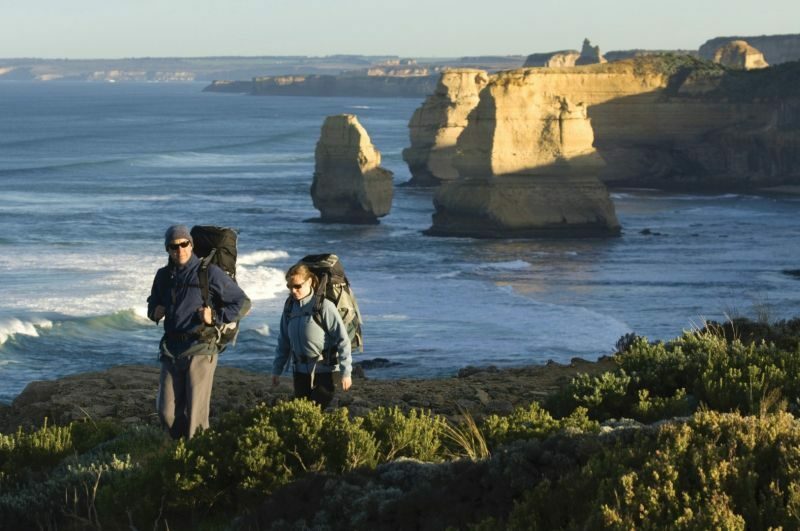 Another company to cater happily to hikers is AAT Kings Inspiring Journeys who have teamed up with Great Walks of Australia to create an exclusive Trail Series of world class hiking experiences. From the magic of Melbourne’s laneways and the Great Ocean Road, explore the Island State or head across the Tasman to the scenic paradise of New Zealand’s South Island, the path less travelled beckons. Here’s a few teasers to tempt you off the beaten track. (15 km per day) Embark on a journey through the pink granite of The Hazards and rich coastal forests of Tasmania’s east coast. Follow the footsteps of the Oyster Bay Tribe as you hike along the well-trodden bush tracks that date back 30,000 years. Explore the wilderness of Freycinet National Park soaking up the spectacular views as you trek up Bear Hill, or test your fishing skills and throw a line into Schouten Passage with our Coxswain Shep. Walk through the sclerophyll forests to renowned Wineglass Bay where you can swim in the crystal clear waters before climbing to the Bay’s Lookout. Discover the fascinating geology of White Water Wall and little Bluestone Bay home to native plants such as the giant Xanthorea. Spend your evening relaxing on the white sands at the award-winning Friendly Beaches Lodge where you recover while indulging in fresh seafood and regional wines. With its dramatic landscapes of azure water, rocky headlands and bolstering boulders, the Bay of Fires Lodge Walk brings Tasmania’s pristine environment to life. In small groups of no more than ten, go off track and wander along the shorelines of Mt William National Park and across the ridgeline of sand-dunes before enjoying lunch in a sheltered cove behind the dunes near Eddystone Point Lighthouse. Along the way, enjoy wine tasting in the Tamar Valley and as the days come to an end, relax and unwind at the luxury Forester Beach Camp and eco-conscious Bay of Fires Lodge. (15 km per day) Wander along the iconic laneways and discover the hidden treasures of Melbourne before setting your sights on Australia’s most prominent coastline as you explore the Great Ocean Road and The Twelve Apostles. On this guided walk, relive the tales of survival and loss of those who travelled by sea as you witness the shipwrecks of early British convicts that sailed in over 200 years ago. Strap up your laces as you prepare for an 11km walk amongst tea-trees and enchanting grass tree forest at Castle Cove. Hike along 2km of soft sand at Johannes Beach before kicking your heels up at Bothfeet Walking Lodge. Head off the beaten track and take a trail dissected by gullies before ascending 138 steps to Cape Volney and Cape Otway. Spend your last day meandering through a native forest that opens up to the Gables lookout, and watch the Apostles emerge as you reach the coastline at Gibson Steps. Here you will take your holiday to new heights with a helicopter ride overlooking the breathtakingly beautiful coastal scenery from the sky. (17 km per day) Immerse yourself in the land of The Long White Cloud and discover the natural beauty that New Zealand has to offer. Start your journey with a scenic jet boat ride down the Hollyford River, disembarking to continue your adventure by foot through ancient forests past giant trees including native Rimu, Totara and Kahikatea. Stroll along Long Reef where you can watch the New Zealand Fur Seals frolic in the open waters and laze on the rocks. Explore the famous landmark separating the powerful Tasman Sea from the Hollyford Valley at Martin’s Bay Spit and view historic sites of Maori occupation. End your journey with a picturesque view of the rugged coast and Milford Sound with a helicopter ride taking in the views from high in the sky.